Protect your lovable pup from the harmful ultraviolet rays of the sun with these stylish doggy goggles for small breeds! Whether its a ride with the window down or for a casual stroll keep your dogs eyes protected from debris. All sunglasses have an adjustable strap to easily customize the proper size for your dog. Each pair of sunglasses is wrapped in a clear rectangular plastic case so you can reuse it as storage. Suitable for: Pet dogs,all types of working dogs,police dogs, search and rescue dogs, quarantine dogs, guide dogs, drug-sniffing dogs, guard dogs, guard dogs, working dogs domains such as subway security dogs. 100% brand new and high quality,Super NICE fashion handsome dog wind and water-proof glasses. Can wear in four seasons,let the baby have super high,Foam cushioned frames and shatterproof lens for easy, comfortable wear. 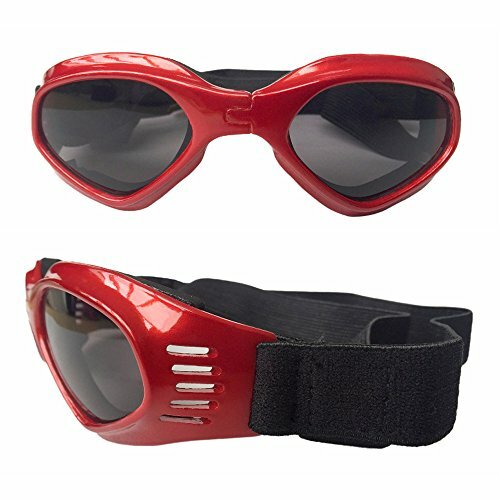 Adjustable head and chin straps to keep goggles securely in place.Suitable for small breeds. 100% UV Protection, and protect their eyes from the wind pressure and debris.Prevent the dogs have all kinds of eye diseases. Keep your pup stylish and safe with these cool doggy goggles! Looks adorable with them on. If you have any questions about this product by CAZZO, contact us by completing and submitting the form below. If you are looking for a specif part number, please include it with your message.